June 24, 2014, was a landmark day for wild land in Scotland, possibly. Scottish Natural Heritage, the government body charged with looking after the environment, issued their latest map of wild land areas and the Scottish Government itself issued a new Scottish Planning Policy and Scotland’s Third National Planning Framework. Unsurprisingly the wild land map received much publicity. Maps are always interesting to look at and you can quickly see what they show. However, welcome though it is, the wild land map is far less important than the much more boring policy and framework documents. The map, after all, is just a map. As SNH are careful to point out the wild land areas it shows are ‘not a statutory designation’. They are described as ‘nationally important in Scottish Planning Policy’ but that doesn’t actually mean anything concrete regarding what happens to them. Headlines on the 24th proclaimed that wind farms had been banned in national parks and national scenic areas. The word ‘banned’ doesn’t appear in the government literature though. Moving on from headlines and the wild land map I’ve been reading through the planning documents to see just what they do say about wild land. I’ve been looking both for intentions and firm commitments. Most of the stuff isn’t about wild land of course – planning covers everything everywhere – but there are some significant passages amongst the mixture of fine words and jargon (actually for government documents these aren’t as wooden and dense as many I’ve read – I didn’t feel the need to clean my mind and read something well written after reading them). That word ‘banned’ in the headlines is based on a section of the Planning Policy which states “Areas where wind farms will not be acceptable: National Parks and National Scenic Areas”. I guess that’s close enough. It’s also highly significant as the 40 NSA’s and the 2 National Parks cover 13% of Scotland, including the Cuillin on the Isle of Skye, Ben Nevis and Glencoe (see map here). This is further emphasised in the Planning Framework which says ‘we do not wish to see wind farm development in National Parks and National Scenic Areas’. I think it’ll be hard to justify wind farms in these areas now and I hope that developers won’t even bother proposing them. This 13% isn’t everywhere on the wild land map though, which covers 19% of Scotland, and the wild land map omits some areas I, and others, would argue are worthy of protection (Trotternish on the Isle of Skye was the first place I noticed). In those wild areas outside the 13% ‘wind farms may be appropriate in some circumstances’ if ‘any significant effects on the qualities of these areas can be substantially overcome by siting, design or other mitigation’. I can see this leading to some tough battles up ahead. One argument will be over ‘landscape and visual impacts, including effects on wild land’, which the policy says should be taken into account. I know from the Allt Duine wind farm debate that developers will always say there are no visual impacts even when there clearly are. 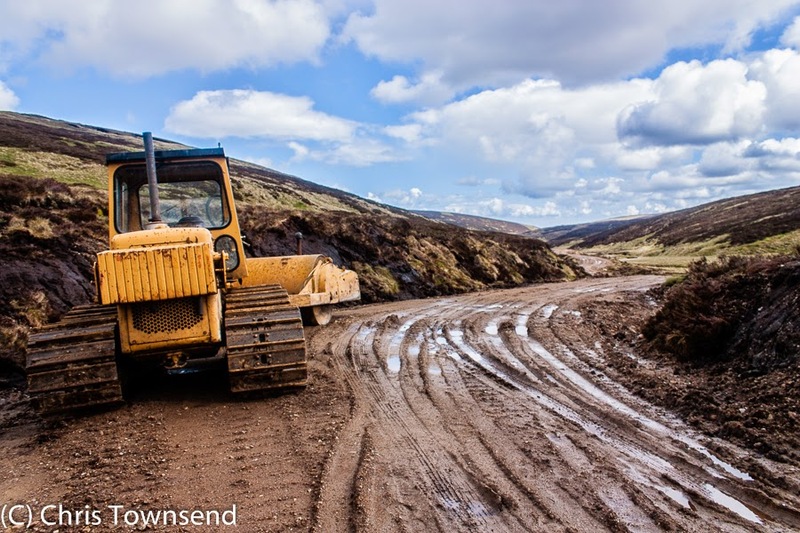 However later on the policy says ‘Wild land character is displayed in some of Scotland’s remoter upland, mountain and coastal areas, which are very sensitive to any form of intrusive human activity and have little or no capacity to accept new development. Plans should identify and safeguard the character of areas of wild land as identified on the 2014 SNH map of wild land areas’. This is an important and welcome statement. I expect it will be quoted much in the future. Unfortunately it is qualified by another paragraph: ‘In areas of wild land, development may be appropriate in some circumstances. Further consideration will be required to demonstrate that any significant effects on the qualities of these areas can be substantially overcome by siting, design or other mitigation.’ Just what ‘significant effects’ are remains to be seen. Apart from wind farms I would argue that bulldozed roads and fences come under that heading and there should be no more on wild land. In the Planning Framework it says ‘we also want to continue our strong protection for our wildest landscapes – wild land is a nationally important asset’. The last half of that sentence is another to be remembered and quoted, the first half rather begs the question as to how there have been wind farms and bulldozed roads on wild land if there is already strong protection. Having read and considered the documents I am cautiously optimistic about the future of wild land in Scotland and I’m happy to praise the Scottish government for the positive statements about wild land. I think they have listened to what many of us have been saying. There will be threats and, I’m sure, losses in the future but hopefully this means much wild land will now be protected. And not just from wind farms. We mustn’t forget bulldozed roads, fences, over-grazing, hydro schemes and other developments. I am quietly celebrating though. I think those of us who love wild land and understand its importance to everyone have made some progress. I raise my glass (malt whisky of course). Here’s to wild land. I fear you're being over optimistic, Chris. Reporters deal primarily with law. 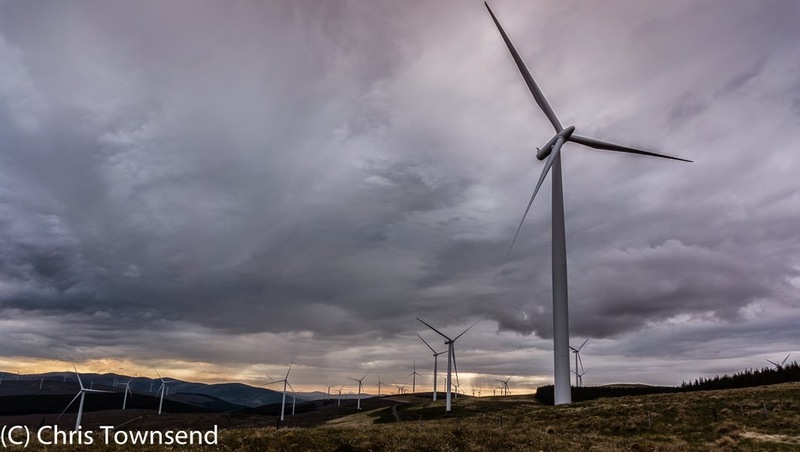 Guidance can be taken into account but the National Planning Framework will always take precedent over this SNH guidance, and the wind farm developers and the Scottish Government know this. It's a fig-leaf of respectability for the SG to hide behind and the NGOs like MCofS and JMT to cling to. At the end of the day, if SSE really want to build a wind power station in an area of National Scenic Beauty as the law currently stands and if they are determined to do so, they still can. I'm afraid I agree with Alan. The SNH map is pretty meaningless. It includes as wild land areas that cannot by any stretch of the imagination be called wild. It excludes areas that anyone would want to call wild instead. 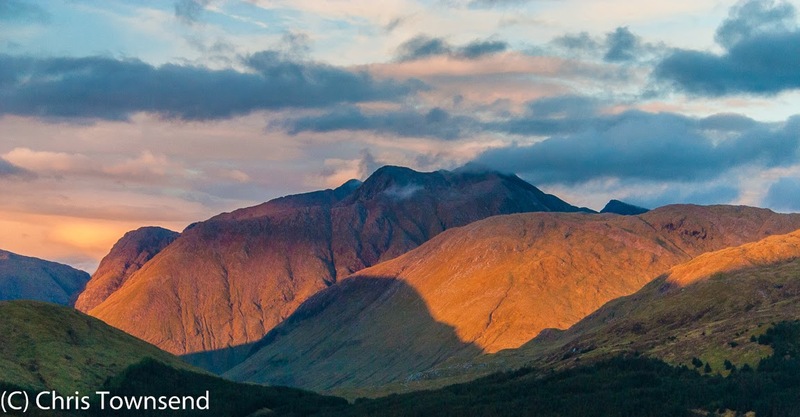 And as the recent decision re Stronelairg has shown (a decision, incidentally, that I would have liked to see flagged on your blog, Chris, if I may put that point to you), genuinely wild land is being sacrificed without consideration for the loss, for all time, of these areas. After all, just consider the figures: given Alex Salmond's commitment to ensuring the equivalent of 100% renewables supplies, they'll need at least twice as many *onshore* turbines. And they've got to go somewhere. They're carpet bombing some areas (like Fife, for instance) with smaller developments, and they are strangely ignoring other areas (like West Lothian, for instance) but the Lowlands are reaching capacity now, and they will simply encroach the designated areas one by one. The SNH map simply makes it easier to build on the *boundaries* of designated land. It's an exercise in spin, pure and simple, and no-one should be taken in by this. My two pennies. And the sad thing is that apart from a bunch of middle-aged blokes going wild camping, very few people give a hoot about losing places like the Monadhliath. Alan and Andy, I think you are both missing the point. Did you read my piece or just assume it was about the wild land map and SNH. It's not. It'a about the Planning Policy and Framework. I make the point in the first paragraph that the map and SNH's comments don't mean anything regarding protection for wild land. Andy, whilst I deplore the decision to build Stronelairg I'm afraid I wouldn't describe the area as genuine wild land. It was until the Glen Doe hydro scheme was built. The reservoir is not the most damaging aspect of this. It's the vast tentacles of roads that spread out far beyond it to a myriad of small dams and extraction works that have done the damage. Walking through it on the Challenge this year to see what it was like I decided I wouldn't go back again anyway, wind farm or not. That doesn't mean Stronelairg is right, it's obviously not - apart from further degrading the area it will be visible from miles around. However the decision has been made and I can see no way of stopping it. I think it's far more important to continue to defend those areas that haven't been ruined yet. The wild land areas don't make it any easier to build on the edges of them - it's already very easy. What they can do is help us defend them. The statements on NSA's are I think very positive. There will be still be more fights and we will lose more land, as I said, but overall I think this is progress. I am optimistic. If I wasn't I'd give up and I'm certainly not doing that. I don't think the Planning Policy and Framework are exercises in spin but we will need to use the positive statements in them to defend wild land. Chris, I kept my post (relatively) brief not to clog up the comments section. I did read your piece and I was a bit confused that you end up saying "I am quietly celebrating", notching up what you think is (small) progress towards defending what's left of the Highlands (and beyond: some areas in the Lowlands are far wilder than anything up North!). What the document seems to show is that they both say that "wild land is a nationally important asset" whilst also saying "In areas of wild land, development may be appropriate in some circumstances". Basically, they're covering all bases (as well as their rear portions...). Make a case that circumstances (i.e. climate change, renewable targets and so on) require building infrastructures on wild land and the first commitment is out of the way. Classic case of what the right hand giveth the left taketh away. So, the positive notes in the document you examined seem to be that in principle they don't want to see wind farms on national parks and NSAs and that wild land is a national asset. Both principles would however be overruled "in some circumstances". If developers were to make a good case, neither the map nor the document would provide any protection. And as you note, it was *already* easy to build on the boundaries of parks and other designated areas. There is nothing in the document that mentions that visual intrusion from outwith those boundaries would severely impinge on the quality of the environment in the designated areas. I'm sorry, I don't see anything to celebrate in this document. The positive statements are anodyne and there is enough stuff in there for developers to exploit. They've become extremely apt at using pseudo-environmentalist language to sell their wind projects, haven't they. The sticking point is still there: they'll have to build twice as many turbines to meet their target. The country is at capacity level already. How many mountain tops are left from which no wind farms are visible? Very, very few indeed, I'm afraid. Even from Torridon you can now see the Outer Hebrides wind farms and soon enough there'll be more inland. It has been a LONG time since I last climbed a hill without seeing some wind farm. More commonly, you see 3 or 4. Now multiply all that by two and the non-designated areas will have to be swamped by turbines, and from the designated areas you'll have a front row seat over them. I hope to be proven wrong and I sincerely hope your optimism will prove to be well-founded, but I've been saying for 15 years now that this country was gone, that we would get or see turbines on and from just about every hill and here in the Lowlands this has become the norm. 15 years ago we were told it would be just a few turbines scattered here and there and for 25 years only. Now we know both were blatant lies. The turbines and tracks are here to stay and they'll come here in numbers that are simply unsustainable. Offshore wind will never take off, lots of projects have been knocked off as you know and those that will go ahead (Firth of Forth and up in Moray) will further devastate the land and the bird population. So, to conclude this long rant, I focused on the map because it seems to me to provide an effective summary of what the document amounts to. Thanks for reading, Chris. Overall I am optimistic that the worst is past, which is not to say there won't be more wind farms. I don't see wind farms from most of the hills I climb - pylons are actually more visible. I think these new planning regs at least give some hope for the future and something to work with. We shall see. Of course I dearly hope you're right, Chris. It's true that pylons are highly visible but we all know we got bigger ones thanks to the wind farms! I'm slightly surprised you say that you don't see wind farms from most of the hills you climb. You seem to spend most of your time in the Cairngorms (you lucky b...r!) and the wind farms to the North are also clearly visible from the tops there (I had a summit camp on Ben Avon last summer and I counted 4 wind farms from there, one of the remotest summits we have). As I say, I do hope you're right. But those extra turbines will have to go somewhere and Stronelairg seems to suggest we'll get hundreds more in that area. And of course I dearly hope you are wrong. Regarding Beauly-Denny I can remember trying to persuade people who were against wind farms in the hills that the two were linked. Many didn't see the connection. From Cairn Gorm you can see the wind farm near the Slochd and one out towards the Dava but I don't remember seeing any from Ben Macdui, Mullach Clach a'Bhlair, Cairn Toul, Monadh Mor, Beinn Bhrotain and other hills in that area. 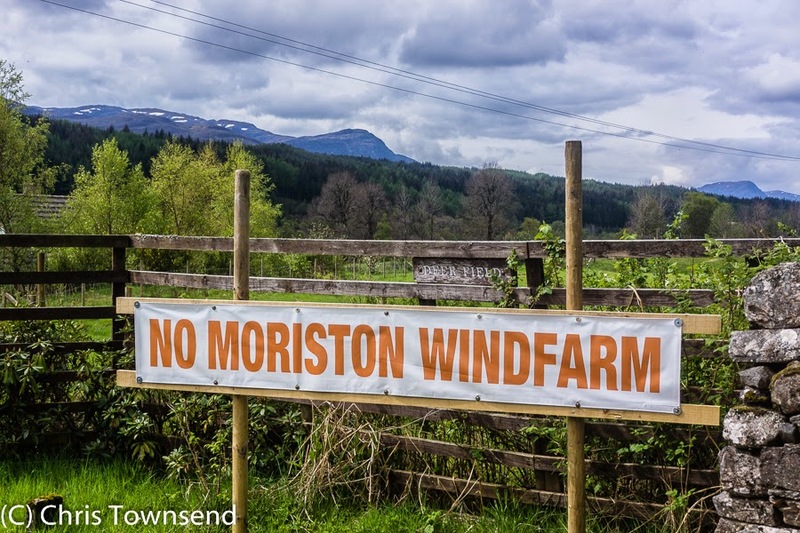 I think the wind farm that is the most intrusive is the one above Glen Moriston. That really does spoil several views. I am not too sure about Macdui myself, but then when I'm there I usually don't look back North because the best views are in the other directions! I'd be surprised if you couldn't see the ones around Inverness though. But you're right, the Millennium one is the worst of them all. The views from Glen Affric are blighted, you see it from Creag Meggy quite clearly and Glen Shiel is not immune either. Not quite sure how visible Stronelairg will be given it's fairly close to it. Och well, one lives and hopes, doesn't one. It would be interesting to find out if any politicians have a financial interest in the manufacturers of wind generators. If so I feel that, if so, these people should be treated in the same way as insider dealers in stocks and shares and prosecuted. I believe our countryside is being destroyed for money, pure and simple. If it was to save the environment then they would be encouraging more personal means of generating energy, such as more localised wind generators, in your garden etc but they don't. Thank you Chris for making this information public. That says it all really - the wind industry will carry on regardless. Actually I thought that statement was interesting because it seems Scottish Renewables are conceding that there will be no wind farms in NSAs. Hopefully this means their members won't bother proposing any. This proposal predates the new planning policy. What will be interesting will be to see if it goes ahead or is withdrawn. It's worth remembering that Scottish Planning Policy is a "non-statutory statement of Scottish Government policy". Therefore NPs/NSAs described in SPP Spatial Frameworks as Group 1 - Areas where wind farms will not be acceptable, could feasibly be subject to a planning proposal if a developer wished to proceed. A key question is whether the CAWL map actually offers 'significant protection'. SPP states "wind farms may be appropriate in [these areas in] some circumstances [and] further consideration will be required to demonstrate that any significant effects on the qualities of these areas can be substantially overcome by siting, design or other mitigation'. Key words here are ‘significant’ and ‘substantially’. All very subjective. Despite calls from (among others) the MCofS, the SG dismissed buffer zones around NPs/NSAs and these are not in SPP. So wind farms sited adjacent to a NP such as Allt Duine could become more of a reality. As with many other WFs for which applications have been made to date, it would not be subject to SPP provisions retrospectively. Much will be dependent upon how local authorities 'set out in their development plans [their] spatial frameworks for wind farms'. I am sceptical about SPP, especially after a recent meeting with the minister for Energy and Tourism. Whilst SPP may be more than window dressing and something (words about protection) may be better than nothing, I suspect that the SG imperative for economic development and meeting REG targets (which are not a cap on generation capacity) will continue to be the key determinant which drives further industrialisation of wild land. To sum up my personal view: It’s business as usual for renewables – and for those who chose to oppose developments in the mountains. From first glance at the developer's claims for expected carbon dioxide savings it appears that they have performed the classic three card trick. They have assumed that the major bulk of CO2 savings will be from the reduction in emissions from coal fired generation, which of course it total nonsense, as it isn't coal that's ramped down when the wind blows more strongly, but gas. Also, by the time this wind farm is built, the UK's fleet of coal fired power stations will have almost halved in size, so this means that the calculations are even more flawed. They have also not taken into account the construction of haul roads and the wind farm's own share of the new power distribution lines to urban centres. Basically, they have ignored the Scottish Government funded research on the carbon balance of building wind farms. They are, not to put too fine a point on it, lying through their teeth about the payback time for this wind farm. They are also basing the power output for this wind farm on the power curve for a 2.0MW turbine rather than for a 3.0MW turbine that is actually being proposed. But of course, the power curve for a 3.0MW machine will have given substantially lower outputs. They are cramming this wind farm in between an SSSI and a National Scenic Area. Just as I predicted, the developers are going to ghetto-ise the NSAs. This wind farm hasn't been approved yet. Let's wait and see. I suspect there will be quite a few test cases. Of course the developers will push it as far as they can. That's inevitable.